Today marks the long awaited day for our "Semi Final" matches. Our top 4 players have survived all the earlier competition match play rounds are now positioned to continue their quest to earn their right to hold the 2015 Seacoast Championship Cup . 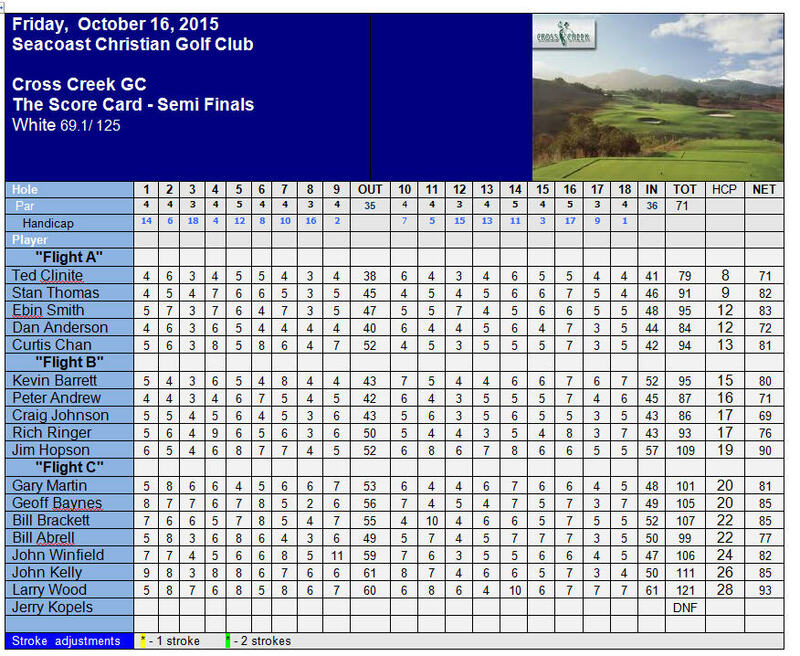 Winners will go on to the "Championship Finals" which will be at Arrowood GC on Friday, October 30, 2015. Still the rest of the field is competing for the "Player's Cup". Here are today's match ups in the Championship Seacoast Cup. Match 1 Deveau vs. Fitzgerald - This match had to be rescheduled for a different date as Paul Deveau had a previous planned trip to Mexico. (rumor has it that he secretly was visiting a special swing coach south of the border to tighten up his game for the end of year playoffs). Lee Fitzgerald was very accommodating to wait an extra week to play this match...this would give Lee an extra week to hit the range and tune up his swing. Since Deveau was out of the country "preparing" for his semi final match, our reported was unable to obtain a travel visa to get any pre match info. 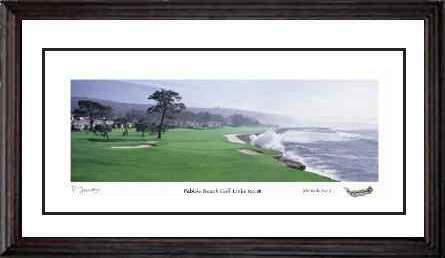 It was reported that Paul played 3 rounds of golf at an exclusive Cabo San Lucas country club. Some private intelligent reports stated that Paul paid big bucks for his special rounds and swing analysis. Asking him if his "vacation" was restful, Paul stated that his game is intact and that he was ready to play his match with Lee. Lee has been very steady all year, and Paul has never been this far in "Seacoast Championship Playoff" play. But Paul has played exceptionally well in the past few matches has he took out a past Champion, Curtis Chan, in his last match. Paul's confidence in his game will be his friend today. Lee came to the course early to warm up, but he secretly reported to our reporter that he went to the range almost everyday to zone in on his short game on mid irons for those 150 yrd shots to the green. After interviewing some workers at the range, it was reported that Lee hit hundreds of balls each day...to the point where some of the mats he practiced on were going to have to be replaced. Lee admitted that hitting balls over several days had taken it's toll on his left elbow to the point he had to visit his orthopedist. It's not clear as to what the orthopedist visit was all about. Lee seemed very calm yet ready to play as the two players got to the 1st tee to play their match. For Lee to be successful today, he'll have to come out early to get the momentum. Lee has the experience in Seacoast Cup match play, as he has also been a past champion. If he plays his style of play, not making multiple mistakes, and focuses on his game, he will be successful. Both players has equal indices this month 14.2...and so this is truly a "head to head " match. Match 2 Clinite vs. Barrett - Ted Clinite has been playing exceptionally well these past weeks, taking out one player after another in these Seacoast Cup playoffs. But today, his opponent, Kevin Barrett, has re tooled his swing over the past 6 months. It has been reported that Ted helped Kevin earlier in the year by selling his lightly used TaylorMade Slider Driver....which has dropped Kevin's index several notches over the past 6 months. Kevin's drives off the tee have been very steady and longer. His short game has been very tight. Various golf media reporters have unamiously reported that Kevin's game has peaked at the right time. Today, this match will be a true test. He'll get 7 stokes today in his match...and he'll need to insure that all those stokes help gain him a win. If Kevin gives himself a chance a pars and eliminates the bogey and double bogey in his game, he'll give Ted a tough match. Ted, has proven he can take it up a notch in competitive post season match play. Every time he takes on a new opponent, he seems to build more confidence in his game. It's been reported that he's been hitting short game shots everyday in his backyard, where he hopes to improve his short game save stats. Ted is a single digit handicap player who knows how to manage his game and will not make too many mistakes. If he get's an early lead in the match, he will put Kevin in a position to take chances in the match where mistakes are waiting to be made. This is a tactic of an experienced player...and Ted knows how to employ this "match play" tactics. Ted has been on a streak of winning...but it is hard to tell how long he can keep this high level of winning going. Today may be the day he faces a tough opponent who may take the match to the end. Our low net winner is: Craig Johnson who posted a low net 67. Match 1 - Deveau def. Fitzerald 7 and 5 - The early morning allowed for players to experience damp fairways and slower wet greens. But right off the start Paul Deveau was able to find his game. Especially he got his putter going as he made par on the first two holes for a 2 up lead. Lee had a very shaky start off the tee and it took 4 holes before he got his first par. By the time they reached the turn, Paul had a commanding 5 up lead. Lee tried to adjust his game and calm his nerves, but he seemed to struggle one hole after the next. Scrambling to save bogey and double bogey is not Lee's normal game, but today he didn't have his "A" game. By the 13th hole, the match ended as Paul seemed to control both the tempo and momentum of the entire match. Lee was a great sport and honorable competitor as he congratulated Paul after the 13th hole. He apologized to Paul for not giving him much of a competition for a "semi-final" match. Paul was very gracious, recognizing that Lee just didn't have the "right stuff" today. In the Post Match Interview room Lee explained...."Today I just disappointed myself and only wish I would have given my opponent a tougher match. My game was out the window today. I just couldn't get loose...even though I seemed to warm up nicely. But I have to admit that I think I actually "over practiced" for this match to the point where my elbow has been bothering me. In fact, it got so bad, my orthopedist MD recommended a cortisone injection to help just two days ago. It did settle down the pain, but I don't think it helped my swing. I just didn't seem fluid and could not get any consistency off the tee box. I know Paul is on a hot steak..but I really just couldn't break out of my deep deficit which I dug myself into after the first 5 holes. Paul really took me to the cleaners today...but he certainly deserved to win when an opponent like me today doubles and triple bogies hole after hole....I'll have to go back to the drawing board, and take a break and let my arm heal up and be ready next year." Paul Deveau was smiling at the lunch table, explaining that he couldn't believe he now made it into the 2015 Seacoast Cup Championship Finals....asking him how he felt the match today went, Paul said, "Lee certainly didn't give me too much pressure today. The pressure has been in my mind all week, but when I saw him struggle on the first 3 holes, I was able to get a quick lead, and then my game relaxed. Lee really beat up himself today...as I feel it became a match between himself and the course. I really feel for him as I've been there many times myself, where your golf swing goes "south" and then it's hard to find it. I know Lee has a much better game than what he brought to the course today....but that's how match play goes. As for me, my game hasn't been been this good for a long time. I have really taken my game to a new level and I hope I can keep this going into the finals." Match 2 - Clinite def. Barrett 3 and 2 - Both players were determined to play their best , and realized that the difficulty of Cross Creek would add the element of "needing to play really well" to be successful today. The match went back and forth as both players tried to take command. But after the front nine, there was only a 1 up lead in Ted's favor. The match remained really close through the next 2 holes, as Ted wasn't able to build on his lead, and Kevin kept grinding and fighting to keep up with the single digit handicap player. Ted finally took a hole on #12 when Kevin failed to par the hole. This put some pressure into Kevin's game as he knew going into the final stretch of holes and being 2 down meant he couldn't make any more mistakes. Ted did make a few openings to the match over the next couple of holes, but Kevin didn't comply and didn't get the necessary pars he needed to tighten up the match. In the end, Ted closed out the match on the 16th hole with a 3 and 2 win. In the post game interview room Kevin explained, " I knew I had to play the best game of my life today...going against a very talented golfer in Ted today. Ted doesn't make too many mistakes and when he does, the opponent has to take advantage of the situation and capitalize on those far and few opportunities. Today, Ted gave me plenty of opportunities, but I didn't capitalize on them when I needed to. As a result, I came out short...but I gave it my very best. I'm happy for Ted , as he definitely was the better player and was in control of his game most of the way. I'll have to retune my stroke..but I'll be back again next year. I had a fun run in getting to this point in the playoffs." .At the local "In & Out Burger"..we caught up with Ted and asked how he was able to handle the pressure today..."I really have challenges at this course. The layout really challenges m game. And being it "Match Play" you really have to plan out your shots. Today, I made a few mistakes, but fortunately for me...Kevin didn't win those holes. He scrapped hard on those holes and instead of winning them...he was only able to tie me. I thought that if he won a couple of those holes, the ending holes would have played out much differently. It really was a close match all day. Kevin just wouldn't go away. I commend him for his efforts and big improvements he's made in his golf game. He truly has made big strides in becoming a better golfer and his playoff appearance shows where's he's at." Congratulations to Paul Deveau and Ted Clinite for getting through the post season playoffs earning their way into the 2015 Seacoast Cup Championship Finals !! Quest for the 2015 Seacoast Cup- This year will be been full of fun times on the golf course. We have added a new dimension to our club’s monthly event play by having Match Play events beginning September 2015. Twenty players will earn their way to this year’s match play event. Points are earned by finishing well in both individual low gross and low net score postings. Also points are earned in different team and individual events ranging from match play, 4 man team best ball, and 2 man best ball events. Net Skins are also another category that allows players to add points to their monthly points. Also this year we have added additional "Major" events which will have increased value in scoring for that particular event. These events will take place in April and July 2015. Seacoast Cup Playoff Season - (September - November). If you have been playing in this golf group for over 5 years then you know that after August, our playoff season begins. Match Play format is instituted for our rounds, in addition to our low gross/low net play. With the added element of "match play," players get to stir up their competitive juices and bring out their game faces to bring out the best golf they've ever played. Many players have shown their "A" game, while others find how difficult it is to play golf when everything is on the line. This year, the Golf Tournament Committee has reviewed the last few seasons and have instituted a few new elements to our "Playoff Season." If a player has sufficient points to be in the "Top 20" then he will qualify to participate in the Seacoast Cup - "Champions" bracket, which will determine our club champion. Below is the playoff calendar of events. Note that events will take place every 2 weeks until November. 1. No more "Bye" weeks for our top 4 players. All players will continue to earn points in our playoff season. The "Top 20" and "Wild Card" rounds will take the top 20 and top 16 players (total points) respectively. This will allow players to possibly lose a match, but still continue in the playoffs if they have the points to sustain their level to be part of the top 16. Only when we get to the Quarter Finals will there be eliminations for losing a match. 2. Players will continue to reply back to event invite emails to obtain their spots for the event. If a "Top 20" player desires not to participate in an upcoming event, then the next seeded player (#19) will then be given the opportunity to play in the "Champions" bracket. 3. "Match Play" points will have an increased value per playoff event. The deeper one goes into the playoffs, the more value for a match play win. For the "Top 20" and "Wild Card" events, players who's match ends in a TIE will split the earned points. Tie matches in subsequent events will have a "tie-breaker" sudden death playoff...see below. 4. "Player's Cup Bracket" - for those who don't qualify or have fallen out of the "Championship Cup" bracket, your points total will transfer into the "Player's Bracket." In the Player's Bracket, players will be matched up with other players in the same bracket to have match play competition. Points will also be earned for Wins and Ties. Value for Player's Bracket wins are 250 points. All Players who fall short of making it to the Semi-Final Championship bracket qualify for the "Player's Bracket." There will be no TIE breakers for tie matches in the Player's Bracket. Points will be split between the two players. 5. Leader board - We coming to the end of Playoff Season. The Finalist have been identified. Ted Clinite and Paul Deveau are two worthy players who will have to battle it out for the trophy. The consolation match will be also played on our next event as Lee Fitzgerald will battle Kevin Barrett for 3rd and 4th place. The rest of the field, will continue to compete for as many points as possible with the season drawing to an end. The points values within the "Player's Cup" division will continue to escalate (now at 500 points) so as long as you come out to play, you too may end up with a winning trophy. The top leader in the "Player's Division" is Craig Johnson, with Peter Andrew, Curtis Chan, Bill Abrell and Dan Anderson closely behind !!! With the close standings of players #6-15, and with the amount of points that are still up for grabs, any one of these players has a chance at becoming the "Player's Cup" winner. So come on out, play well and see how you pair up with your Seacoast Christian GC buddies. Top 20 in "Match Play" competition. Top 16 players move onto next round. All other players compete in "Player's Bracket." Points earned for match play win/tie, gross / net scoring. Top 16 Players are matched up according to their points totals: The top 8 Players advance to "Quarter Finals." All other players compete in "Player's Bracket". 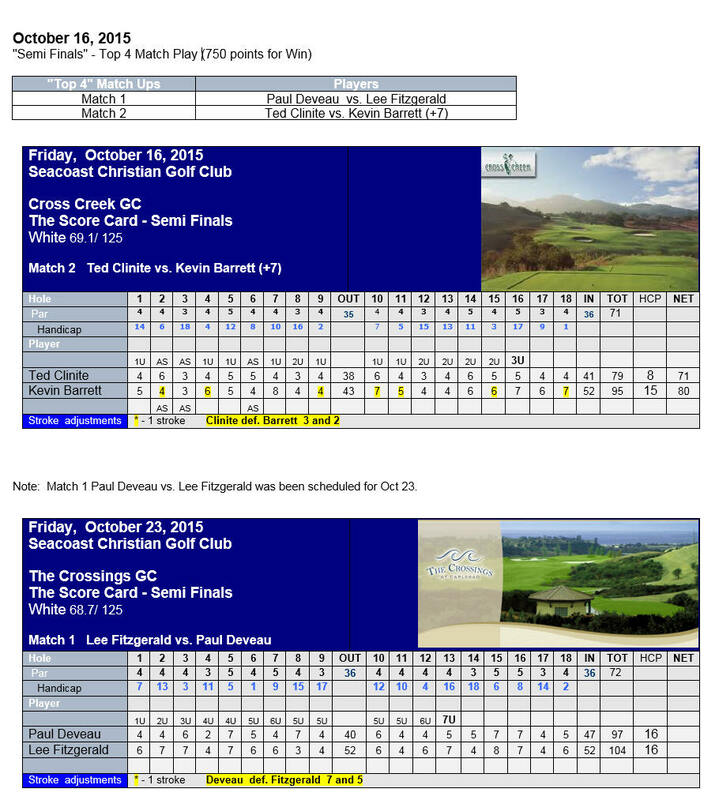 Points earned for match play win/tie, gross / net scoring. #1 Seed player vs. #8, #2 vs. #7, etc. 4 Players who win matches move on. Rest of field competes in "Player's Bracket". Points earned for match play win/tie, gross / net scoring. #1 Seed player vs. #4, #2 vs. #3, Winners move onto to Championship Finals. All others compete in "Player's Bracket." Points earned for match play win/tie, gross / net scoring. Our 2 winners from the Semi Finals meet up to determine our Champion. Consolation match also conducted to determine 3rd and 4th place. Player's Bracket Winner will be determined...total points. 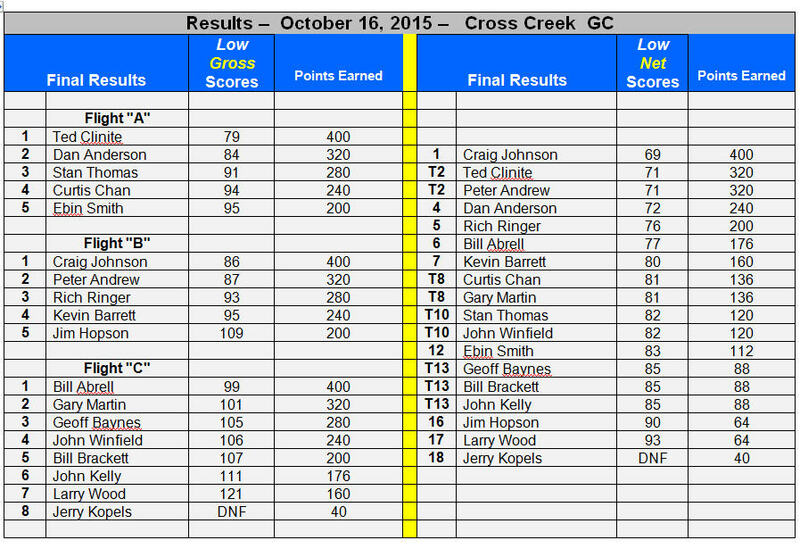 Points earned for match play win/tie, gross / net scoring.